Determine the Critical Control Points (CCPs): You will need to determine at what points in your process controls can be applied to prevent or remove hazards. Establish critical limits: For example set temperature limits, time limits, PH level etc. If this limit is exceeded at any point action must be taken immediately. Monitor your CCPs: You need to establish a system which means your CCPs will be regularly monitored. For example someone performing visual checks or using instruments to monitor variants such as temperatures. *Many of the instruments that ETI manufacture will cater to this part of your HACCP plan. For example performing temperature checks is made easier when using an instrument such as the Therma 20/22 Plus Thermometers which have been specifically designed for use in the food processing industry with HACCP and health and safety procedures in mind. The Therma 20 Plus Thermometer comes with a FREE traceable certificate of calibration and 2 year guarantee. This instrument has an accuracy of ±0.4°C. It also has the ability to change probes, set a max/min limit and hold the temperature on screen. Corrective action for CCPs: If one of your critical control point limits is exceeded then it is important to know what corrective action will be taken. This needs to be planned ahead of time to ensure minimum damage when the incident occurs. HACCP Documentation: An audit could come at any time therefore you need to be prepared for this to happen every day. Documenting your procedures is essential when an audit occurs as the inspector will want to see that your HACCP is in place and working. 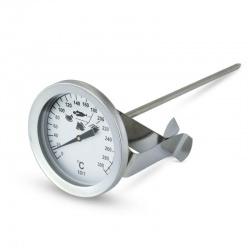 *The Saf-T-Log® Thermometer is a paperless temperature recording instrument making it perfect for daily documentation and adhering to your HACCP plan. 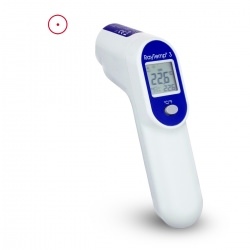 The Saf-T-Log® Thermometer displays the date, time & user name with each temperature reading, automatically archives data and creates reports, has the ability to display a PASS/FAIL action and can hold up to 7 different checklists. This means you can measure, store, download and print HACCP reports. No more paper logs or complicated PDA’S to train your staff to use! The Saf-T-Log® includes Windows® software to create a list of up to 300 items that you routinely measure, 10 corrective actions, along with up to 25 users. The data is archived and a PDF report generated automatically with no additional user input. The Saf-T-Log® report is locked so the data logged cannot be tampered with. Review: You should regularly review both your HACCP plan and the instruments you have in place to ensure they are both fulfilling the requirements of a food safety management system. For example getting your thermometers calibrated and checked regularly.